Although most living organisms are composed of large amounts of water, it is not inevitable that freezing these organisms results in ice-formation. Among amphibians and insects that can tolerate freezing, there is wide variation in the amount of freezing they can tolerate. Species of frogs can spend days or weeks "with as much as 65 percent of their total body water as ice". Some amphibians achieve their protection due to the glycerol manufactured by their livers. Glycerol is "antifreeze", it reduces ice formation and lowers freezing point. Glycerol (glycerin), like ethylene glycol (automobile anti-freeze) is a cryoprotectant. The sugar glucose is also a cryoprotectant — and arctic frogs have a special form of insulin that accelerates glucose release and absorption into cells as temperatures approach freezing. A cryoprotectant can make water harden like glass — with no crystal formation — a process called vitrification. Freezing-damage to cells is due to the formation of ice-crystals. Insects most often used sugars for cryoprotectant. They may also refrain from eating (not such a hardship because their metabolism slows at low temperature) and utilize tough waxy coverings to keep nucleating substances out of their body when temperature drops. Adult arctic beetles (Pterostichus brevicornis) normally endure temperatures below −35ºC. These beetles have been frozen in the laboratory to −87ºC for 5 hours without apparent injury, ie, they demonstrated "directed, coordinated activity such as walking, feeding, and avoidance response, and no paralysis or erratic behavior..." [SCIENCE 166:106-7 (1-OCT-69)]. (A replication of this experiment would be of value to confirm or challenge the results.) This would seem to indicate that neurological tissue can, in principle, recover in a functional way from vitrification. The glycerol, sugars, and other cryoprotectants which are produced naturally in these organisms, are not found in levels that adequately explain (with current knowledge of cryobiology) the remarkable freezing-tolerance. Water is not very viscous, therefore it can be vitrified only by an extremely rapid "flash-freezing" of a small sample about 3 million ºC per second to −135ºC. Under such rapid cooling, water molecules don't have time to arrange themselves into a crystalline lattice structure. Viscosity increases very little when water is cooled, but at freezing temperature a sudden phase transition occurs to an ice crystal. Molten silica (silicon dioxide, SiO2, liquid glass), by contrast, is very viscous. This viscosity is the result of the tendency of silica to form amorphous networks of polymers rather than to arrange in an orderly crystal lattice. Quartz (rock-crystal) & sand are examples of SiO2 as pure crystal. SiO2 which has been made to exist in noncrystalline form is called vitreous silica (fused silica). Oxides can be added to prevent crystallization and promote vitrification. About 90% of all manufactured glass (called soda-lime glass) contains about 12% each of soda (Na2O or Na2CO3) and lime (CaO) added to the SiO2. The soda is analogous to cryoprotectants in preventing crystallization (the lime is added to prevent the glass from dissolving in water). By cooling silica very slowly it is possible to form rock crystal, having very high density and low volume. By cooling faster, resistance to crystallization due to viscosity & the absence of nucleators causes silica to pass below its freezing temperature (supercool) and vitrify at some glass transition temperature (Tg). 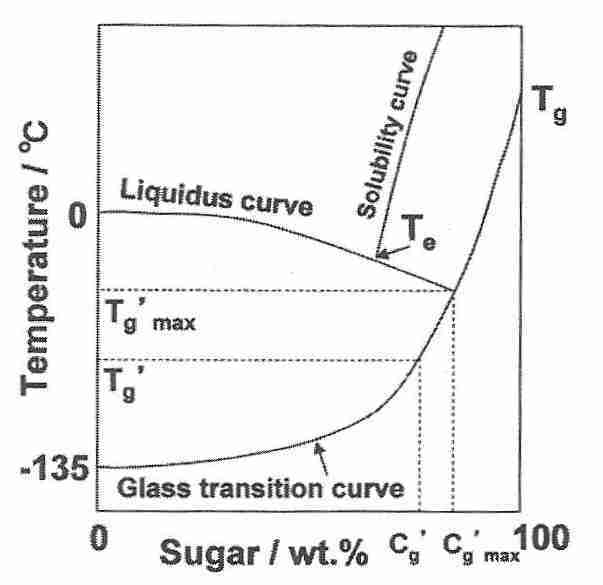 Viscosity increases rapidly to solidification near Tg, but over a small temperature range rather than at a precise temperature (in contrast to crystallization or fusion, which occurs at a precise temperature). The change that happens at Tg is simply a rapid increase in viscosity, not a change of state. 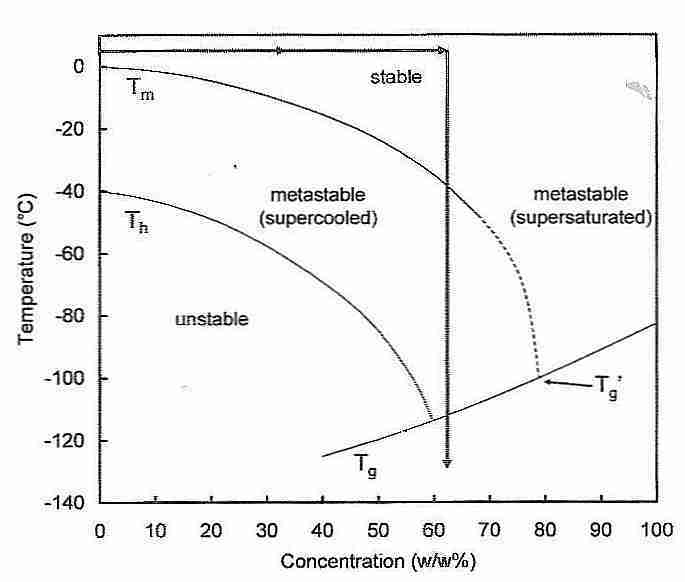 Viscosity becomes very high near Tg when cooling from above, which means that Tg is better characterized as a "rubber/glass transition" than a "liquid/glass transition". Moreover, Tg is a function of cooling-rate. A faster cooling-rate results in Tg at a higher temperature leading to a solid that has a high volume (lower density), is more amorphous and less viscous. A slower cooling-rate results in Tg at a lower temperature leading to a solid that has a low volume (higher density), is less amorphous and is more viscous. In practice, Tg occurs within a narrow temperature range because changing cooling rate an order of magnitude (ie, by a factor of ten) only changes Tg by 3−5ºC. Sugar, like silica, can form a crystal (rock candy) or a glass (cotton candy) depending on the rate of cooling. Like molten glass, liquid sugar is very viscous and prone to formation of amorphous polymers. In silica the polymerization bonds tend to be of a "mixed" covalent-ionic type, whereas for sugar the polymerization is assisted by weaker forces (van der Waals or hydrogen bonding). In neither case do these bonds have the defined bond-lengths and bond-angles of covalent bonds. Glycerol/water in the human body is more like sugar than like silica. But the situation is complicated by the presence of many salts, proteins, fats, etc. Vitrifying liquids have been classified as "strong" or "fragile". The term fragile is confusing because it does not refer to the tendency to break under mechanical stress, but rather to a highly rapid rise in viscosity as temperature approaches Tg from above. Substances which are called fragile tend to have more ionic bond types (or hydrogen bonds), whereas substances which are strong (and show a modest decline in viscosity above Tg) have more covalent bonding. "Gripping strength" changes more radically for ionic bonding near Tg. Covalent bonds are stronger (less fragile), and groups of molecules held together by covalent bonds are less susceptible to molecular phase changes just above Tg. Glycerol-type cryoprotectants (which cohere mainly by hydrogen bonding) are more "fragile" than vitreous silica (which has covalent coherence), but is less "fragile" than ionic substances. If rapid cooling causes vitrification, it seems plausible that rapid application of pressure could do the same thing — at above Tg for rapid-cooling. Because Tg is a function of cooling rate, there is no reason why it could not also be a function of pressure-application rate — or some combination of the two (plus cryoprotectant). It is known that pressure distorts the ice I lattice from its ideal tetrahedral orientation, and this could be important in preventing nucleation. Water can be made to vitrify if cooled at a rate of millions of degrees Celcius per second. Water can also vitrify if mixed with salts or cryoprotectants. Salt solutions have their highest Tg at their eutectic concentration, but this would be too concentrated for cryobiological applications. Salt solutions having cations with a high oxidation state (e.g., trivalent cations) and more basic anions (e.g., citrate) are better glass-formers (have a higher Tg) than salt solutions that do not. Nitrates vitrify better than chlorides, and magnesium (Mg2+) vitrify better than salts of zinc (Zn2+) [THE JOURNAL OF CHEMICAL PHYSICS; Angell,CA; 52(1):1058-1068 (1970)]. When freezing occurs in aqueous mixtures of non-crystalline solutes (such as ice cream), the unfrozen freeze-concentrated solute can display a transition temperature Tg' that has a more prominent thermal signature than Tg. Tg' is the Tg of the unfrozen portion of a sample that contains ice. For ice cream, Tg' is about −32ºC and the unfrozen water (Wg') is about 35 wt% [FOOD CHEMISTRY; Owen Fennema; 3rd Edition; Table 11; page 76]. (Wg is water content of the sample at Tg, whereas Wg' is the unfrozen water content at Tg' — which has been called bound water, as if that term could be applied to the water content of any vitrified sample). For low molecular weight solutes, Tg' (and Tg) typically increases with molecular weight. Biopolymers (starch, gluten, collagen, albumins, etc.) of high molecular weight typically have Tg' near −10ºC. Aqueous solutions of cryoprotectants can themselves freeze, and have an unfrozen portion that solidifies at a temperature Tg' which is considerably higher than Tg [JOURNAL OF FOOD SCIENCE; Brake,NC; 64(1):10-15 (1999)]. The glass transition temperature of the maximally freeze-concentrated portion of the sample (Tg') should, by definition, exhibit the same high viscosity as Tg [FOOD RESEARCH INTERNATIONAL; Bai,Y; 34(2-3):89-95 (2001)]. The Tg' will be below the eutectic temperature [PURE &AMP; APPLIED CHEMISTRY; Goff,HD; 67(11):1801-1808 (1995)]. Mixtures of basic amino acids with hydroxy dicarboxylic acids added to the protein solute can raise Tg' by hydrogen-bond networking [CHEMICAL &AMP; PHARMACEUTICAL BULLETIN; Izutsu,K; 57(1):43-48 (2009)]. If ice is formed in a mixture intended to vitrify — as in an imperfectly perfused cryonics patient — the vitrification mixture remaining in the unfrozen portion will have a higher concentration and, thus, a higher Tg (which will be Tg') [Figure 1; CRYOBIOLOGY; Wowk,B; 60(1):11-22 (2010)]. 57(1):43-48 (2009)]. The other source of assistance for vitrification comes from ice blockers. While cryoprotectants slow ice-crystal growth and formation, ice blockers act specifically against the formation of the ice nuclei which are necessary for freezing to begin. Arctic fish use ice-blocking proteins to keep the freezing temperature of their bodies at or below −2.2ºC, which is below the freezing temperature of seawater (−1.9ºC). Some plant flavonal glycosides can depress freezing temperature by as much as 9ºC [CRYOBIOLOGY; Kasuga,J; 60(2):240-243 (2010)]. Although the melting temperature of water is 0ºC, water that is absolutely pure will not freeze above −40ºC because water requires nucleating agents to begin crystal growth [PHILOSOPHICAL TRANSACTIONS OF THE ROYAL SOCIETY OF LONDON; Lundheim,R; 357:937-43 (2002)]. Tapwater has enough nucleating agents that ice trays in refrigerators can freeze water at close to 0ºC. Water with small amounts of nucleating agents can be supercooled, but once ice crystals begin forming they spread with explosive speed. The temperature at which pure water will freeze (−40ºC) is called the homogenous nucleation temperature (Th) — in contrast to Tm, which is the melting temperature (0ºC). The temperatures between Th and Tm are the region of heterogenous nucleation — where the ice formation is a function of time and nucleating agent concentration (or nucleating ability of the nucleators). Heterogenous nucleation takes its name from the fact that the nucleus around which ice crystal growth occurs is composed of both water molecules and other kinds of molecules. Conversely, in homogenous nucleation the only molecule found in the crystal nucleus is water. The string used to make rock candy from a cooling super-saturated sugar and water mixture acts as a heterogenous nucleator around which the sugar molecules can crystallize. At temperatures close to −40ºC in the sky (in polar regions and above 30,000 feet), homogenous nucleation occurs whenever there is a sufficient concentration of water vapor. Silver iodide (AgI) is water-insoluble and has a crystal structure similar enough to ice that it can readily act as a heterogenous nucleator below −5ºC. Silver iodide is especially suitable for seeding rainclouds because it can be micronized into particles smaller than 10 nanometers. for J(T) in meters3/second and T in ºC [Vali,G; Ibid; p.4]. The e−3.9T factor means that the probability of nucleation increases by about 50 for each drop of 1ºC — or by over 6 million (504) for a 4ºC temperature drop. Although volume and time are linear components in the probability, the exponential temperature component means that probability rapidly goes from zero to one in the temperature range between −38ºC and −42ºC (being very close to −40ºC for all practical purposes). Not surprisingly, the probability of heterogenous nucleation in an animal increases with body size (volume). Some species of reptiles with body mass less than 20 grams can supercool to temperatures below −5ºC, but not reptile having body mass greater than 40 grams can supercool to as low as −2ºC [Costanzo,JP & Lee,RE,Jr. ; "Supercooling and Ice Nucleation in Vertebrate Ectotherms" in BIOLOGICAL ICE NUCLEATION AND ITS APPLICATIONS, p.229; Richard E. Lee, Jr., et. al., Editors; APS Press (1995)]. Higher pressures lower Th and elevate Tm [CRYOBIOLOGY 21(4):407-426 (1984)]. Increasing cryoprotectant concentrations lower both Th and Tm, but the effect is more dramatic on Th than on Tm. 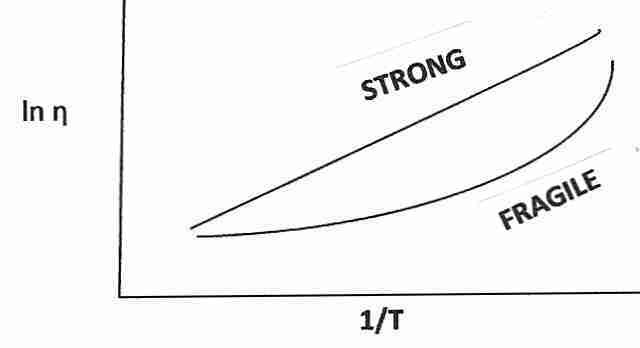 As shown by the two-headed arrow in the figure, enough cryoprotectant to lower Tm by 30ºC will lower Th to the glass transition temperature (Tg) — thereby eliminating homogenous nucleation. Using ice-blockers to prevent heterogenous nucleation creates the possibility of eliminating nucleation (ice formation) altogether — and achieving vitrification at roughly 55% cryoprotectant concentration. The double-arrow shown in the diagram serves to focus attention on another phenomenon which needs to be addressed in attempting tissue cryopreservation. 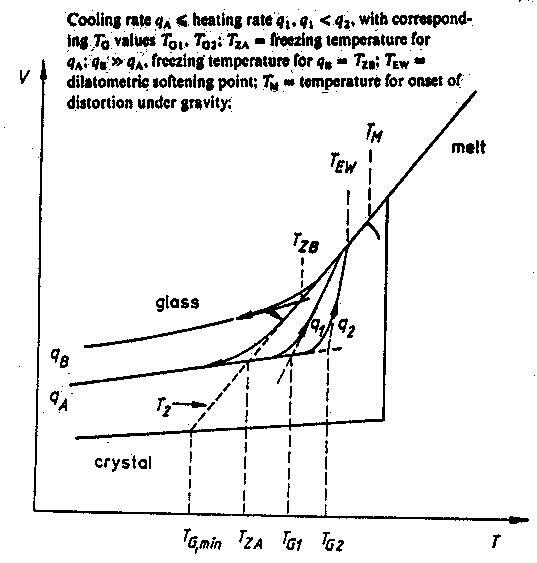 Namely, that maximum nucleation occurs just above Tg near the downward-pointing arrow (−80ºC to −120ºC) and that maximum ice-crystal growth-rate occurs just below Tm near the upward-pointing arrow (−80ºC to −40ºC). (The location of the arrowheads is not significant.) The significance of these facts is that it is much easier to avoid ice-crystal formation when cooling (vitrifying) than when re-warming (de-vitrifying). The many nuclei formed when cooling in the −80ºC to −120ºC range can cause massive ice growth when rewarming in the −80ºC to −40ºC range. This is called the devitrification problem. Before the use of ice-blockers it was believed that only radio-frequency rewarming technology could possibly achieve rewarming rates rapid enough to avoid ice-crystal formation upon devitrification. With ice-blockers, however, ice crystal growth is greatly inhibited during rewarming. Ice crystals can grow along six symmetric axes — the a−axes, all six axes in the same plane — or the c−axis, which is perpendicular to the plane of the six a−axes. Ice crystal growth at higher temperatures typically occurs along the a−axes, which accounts for the familiar hexagonal shape of snowflakes. 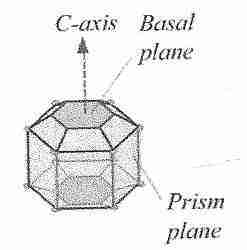 C−axis growth results in needle-like, spicular ice crystals, which are potentially damaging [THE FASEB JOURNAL; Davis,PC; 4(8):2460-2468 (1990)]. (For more detail on ice formation see The Freezing Process.) Ice blockers can act by three mechanisms: (1) bind-to and inactivate heterogenous nucleating substances, (2) block a−axis growth or, (3) block c−axis growth. In anti-freeze proteins, amino acids such as threonine & serine hydrogen-bond to the ice [CRYOBIOLOGY 41(4):257-279 (2000)]. Inhibition of a−axis growth by anti-freeze proteins typically is found in arctic fish. Arctic insects, by contrast, typically have anti-freeze proteins that inhibit c−axis growth. 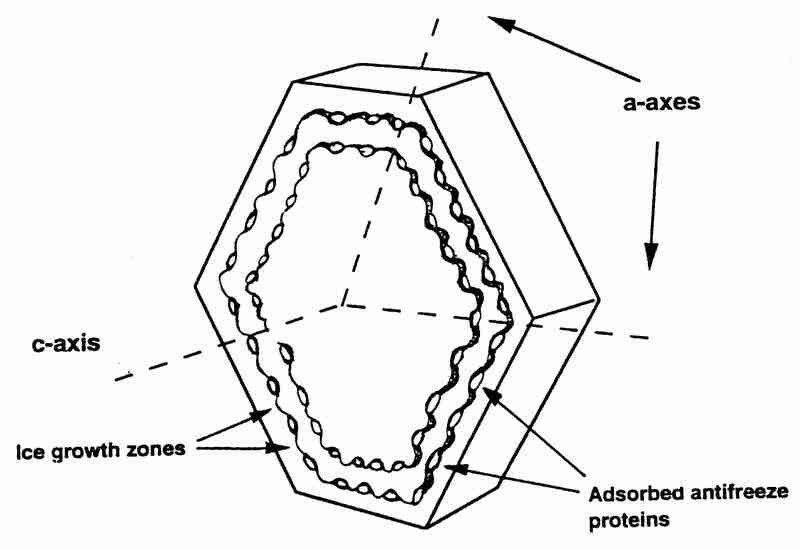 By binding to the basal plane (c−axis) rather than the prism plane (a−axis), insect anti-freeze proteins can depress freezing temperature by 4-5ºC, whereas fish anti-freeze proteins only depress freezing temperature by not much more than 1ºC [BIOPHYSICAL JOURNAL; Pertaya,N; 95(1):333-341 (2008)]. Not all ice-blockers are proteins. In fact, 21st Century Medicine (21CM) researchers have discovered that the polymer polyvinyl alcohol (commonly found in adhesives such as Elmer's glue & postage-stamp glue) is an extremely effective ice-blocker if used in the syndiotactic stereochemical form. In the isotactic stereochemical form, the hydroxyl groups are all on the same side of the molecule, whereas in the syndiotactic stereochemical form, the hydroxyl groups are on alternate sides of the molecule. Polyvinyl alcohol in the syndiotactic stereochemical form is an excellent fit — size & conformation — for attaching to an ice-crystal surface. Every hydroxyl group of the polyvinyl alcohol will hydrogen-bond to a water molecule. The polyvinyl alcohol molecules adhere to ice crystals (preventing growth) at temperatures as high as −30ºC, above which temperature separation begins to occur and ice-blocking activity diminishes. Polyvinyl alcohol is most effective against c−axis growth — and most effective in the temperature range of maximum nucleation. 21st Century Medicine researchers have produced a patented co-polymer (mixture of polymers) consisting of 20% vinyl acetate and 80% vinyl alcohol which they now sell as the commercial product Supercool X-1000. It is believed that the vinyl acetate reduces self-association of the vinyl alcohol, making the latter more available for ice-blocking [CRYOBIOLOGY 40(3):228-236 (2000)]. A 0.01% solution of X1000 can reduce the amount of glycerol needed to vitrify by 3%. A 1% solution of X1000 can reduce the amount of glycerol needed to vitrify by 5%. Concentrations of X1000 greater than 1% do not provide much additional benefit. Although these percentage differences may seem small, the benefits from ice-blockers are actually very great. Toxicity increases exponentially as the cryoprotectant concentrations reach the high levels needed to vitrify. Of particular relevance to cryonics, however, is the fact that cryoprotectants become too viscous to perfuse well at high concentrations, whereas ice blockers add little to viscosity. Thus, ice-blocker plus cryoprotectant can produce a solution that can both perfuse and vitrify. The widespread presence of biological nucleators in the environment causes water to freeze close to 0ºC rather than at −40ºC. The most abundant and widely distributed nucleator is protein on the surface of the Pseudomonas syringae bacteria, a kind of bacteria that causes early freezing damage on plants (most commonly found on plant leaves, and other above-ground plant parts) [PHILOSOPHICAL TRANSACTIONS OF THE ROYAL SOCIETY OF LONDON; Lundheim,R; 357:937-943 (2002) and APPLIED MICROBIOLOGY; Maki,LR; 28(3):456-459 (1974)]. Such proteins must assume a rigid, ice-like conformation larger than 10 nanometers and be able to aggregate [JOURNAL OF MOLECULAR BIOLOGY; Kajava,A; 232(3):709-717 (1993)]. 21st Century Medicine researchers have succeeded in finding an ice-blocker that specifically binds-to and inactivates heterogenous nucleating agents. (These proteins evolved specifically to cause freezing at the highest possible temperature). The linear polymer polyglycerol (PGL) binds and inactivates these proteins, and is complementary to the action of polyvinyl alcohol (PVA). PGL is ineffective at inhibiting nucleation in small volumes, but is more effective than PVA at suppressing initial ice nucleation events in large volumes. The lowest number of visible ice-nucleation events is achieved with 0.1% PGL and 0.9% PVA [CRYOBIOLOGY 44(1):14-23 (2002)]. (PVA can also bind-to heterogenous nucleating agents.) 21CM now markets this formulation as Supercool Z-1000. Ice blockers cannot cross cell membranes and do not cross an intact blood-brain barrier, which means that for a cryonics patient in good condition the only portion of the brain containing ice blocker will be the vasculature (about 4% of the brain). Ice blockers are not needed inside of cells because cells contain few nucleators — cryoprotectant diffusion into cells is adequate. Ice blockers in the brain vasculature could prevent ice crystals from forming in the blood vessels which could propagate through the blood-brain barrier, especially in areas that are weakly perfused due to poor circulation. Circulation is often very poor in cryonics patients and the blood-brain barrier is frequently damaged. Although poor perfusion and reduced cryoprotectant concentration poses a danger of ice formation, ice blocker concentration will also be reduced in those areas and may not be of benefit. As a cautionary note, it should be mentioned that use of ice-blocker without sufficient cryoprotectant (or rapid-enough cooling) to cause vitrification can result in ice formation that is more damaging than the ice that would have formed at a higher temperature if no ice-blocker had been used. Ice-formation at higher temperature tends to be extracellular — and dehydrates the cells. At lower temperature osmosis is less active. So if ice-blockers simply result in ice formation at a lower temperature, the ice that forms at those temperatures is more likely to be inside the cells, thus causing greater damage. In 1949 it was discovered that glycerol can be used to protect bull sperm against freezing injury. A year later, the same techniques were successfully applied to red blood cells. Since that time large industries have developed around the cryopreservation of bull sperm and human blood. In 1959 the substance DiMethyl SulfOxide (DMSO) was demonstrated to be useful as a cryoprotectant. DMSO passes through cell membranes more readily than glycerol, but it can be more toxic at higher temperatures. In 1972, 8-cell mouse embryos were cryopreserved to liquid nitrogen temperature temperature and rewarmed to obtain live mice, thanks to slow cooling and skillful combination of DMSO with glycerol. Glycerol is introduced first, the embryo is cooled to a low temperature, and then the highly permeant DMSO can be introduced with minimal toxic effect. In 1983 a human pregnancy was first established by Trounson & Mohr using an 8-cell human embryo, which had been cryopreserved to liquid nitrogen temperature using gradually increasing concentrations of DMSO — giving time for equilibration to prevent osmotic damage (PBI 10 minutes, 0.25M DMSO 10 minutes, 0.5M DMSO 10 minutes, 1.0M DMSO 10 minutes, 1.5M DMSO 10 minutes) [FERTILITY AND STERILITY 46(1):1-12 (1986)]. Over 50% of nematode worm (C. elegans) larvae and about 3% of adult nematodes can survive cooling to liquid nitrogen temperature. The required protocol is pre-treatment with 5% DMSO at 0ºC for 10 minutes, cooling from 0ºC to −100ºC at 0.2ºC/minute, being plunged into liquid nitrogen (−196ºC) and ultimately rewarming to −10ºC at a rate of 27.6ºC/minute. [CRYOBIOLOGY 12(5):497-505 (1975)]. This is particularly noteworthy insofar as nematodes are fully functioning organisms with a digestive system, reproductive organs, muscles and a nervous system consisting of approximately 300 neurons. In an organ with such high water & fat content as the brain, proper perfusion to protect the very delicate cell-to-cell relationships (synaptic connections) would be expected to be especially difficult to achieve. It has been known since the 1950s, however, that brains have a certain tolerance for ice crystallization. Audrey Smith [PROC. ROYAL SOCIETY B 145:427-442 (1956) and BIOLOGICAL EFFECTS OF FREEZING AND SUPERCOOLING, A.U.Smith, Ed., p.304-368] demonstrated that hamsters could be slowly cooled to nearly −1ºC such that over 60% of brain water is turned to crystalline ice — with no gross loss of normal behavior upon rewarming. The mechanism of this effect is based on the fact that intracellular ice crystallization & elevated intracellular salt concentrations causes the greatest damage. When tissues are cooled slowly, extracellular crystallization starts first — and water tends to migrate out of cells to freeze in the extracellular space. If the intracellular electrolyte concentrations increase, it is evidently not enough to cause observable neurological damage at the 60% level. The cryoprotectant glycerol has long been used in vitrifying human blood & sperm — and for many years was used to reduce freezing in human cryonics patients. Glycerol cannot be used to completely vitrify organs or cryonics patients because it is not possible to perfuse organs with high enough concentrations of glycerol to fully vitrify. When perfusion is performed with full-strength glycerol, enough glycerol gets into the tissues to achieve partial vitrification with about 20% ice formation. Cryopreservation of tissues & organs is much more difficult than cryopreservation of small collections of cells. Time is required for cryoprotectant to permeate an organ and also for temperature to penetrate. Tissue is subject to degradation if there is no blood circulation even if the temperature is very low, yet a very low temperature will slow the rate of cryoprotectant perfusion. Moreover, organs can be damaged by even extremely small amounts of ice formation due to the critical cell-to-cell relationships which must be maintained for proper function. Even so, cryoprotectants have been used to preserve bone marrow, fetal hearts, intestines, parathyroid glands, skin, spleens, thymus glands, etc., which have been slowly cooled to dry ice temperature (−79ºC) — all without ice crystal damage. Crystallization is not an inevitable consequence of glycerol cooling. A 68% v/v (volume/volume) glycerol/water solution will not crystallize at any subzero temperature — it simply hardens like glass. But concentrations of glycerol much greater than 55% v/v have been called too viscous & toxic for cryonics use. Shortly before Alcor began using vitrification solutions, cryobiologist Brian Wowk determined that a combination of 58.4% v/v (8 Molar) glycerol and 1% X1000 ice-blocker could vitrify a 2 liter flask — presumably meaning that a brain could be vitrified with 8 Molar glycerol and 1% X1000 ice-blocker. Most tissues can tolerate having over 80% of the water in the form of ice crystals upon slow cooling without noticeable damage upon re-warming. Most organs can tolerate 40% of water as ice crystals without damage upon re-warming. As mentioned above, the brain is an especially ice-crystal tolerant organ, insofar as 60% water as ice-crystals causes little gross damage. The experiments of I.Suda [NATURE 212:268-270 (1966) and BRAIN RESEARCH 70:527-531 (1974)] indicate that cat brains cooled to −20ºC in 15% v/v glycerol (62% brain water as ice) for 777 days and 7.25 years, both show normal-looking EEG patterns upon re-warming — although neurological activity is less for the 7.25-year brains. Hemorrhaging and cell loss of these specimens probably could have been prevented using several measures: (1) addition of glucose (nutrient) to the perfusion fluid, (2) careful washing of glycerol from the brains as part to the thawing/reperfusion process and (3) storing the brains at lower temperatures with higher glycerol concentrations. where "P" is the percentage of liquid volume of an organ which can be converted to ice without crystal-damage. This formula is the equation of the line in Figure 3 of the paper. It is related to the fact that a mixture of 68% glycerol and 32% water (volume/volume) will vitrify completely. ie, 27.2% v/v glycerol (3.72 Molar) should be sufficient to prevent ice-crystal damage to brains cooled to any subzero temperature (including liquid nitrogen temperature, −196ºC). In fact, rabbit brains perfused at room temperature with 23% v/v glycerol (3 Molar) and cooled to dry ice temperature (−79ºC) show excellent histological preservation under a light microscope [CRYOBIOLOGY 21(4):407-426 (1984)]. For years cryonicists believed that "the Smith Criterion" of a minimum of 3.72 Molar glycerol concentration might be adequate to prevent freezing damage in cryonics patients. In the December 1991 issue of CRYONICS magazine, a cryobiologist described the results of an experiment with a single rabbit brain perfused at room temperature with 3.72 Molar glycerol, cooled to −130ºC, cut into slabs, and the resulting slabs stored at −78ºC for many months before examination under an electron microscope. He states: "...the pattern of ice formation seems to be potentially quite damaging. Everywhere one looks, thick sheets of ice are found stabbing their way through brain tissue with apparent abandon." But if this is true, how can we explain the complete neurological recovery of Audrey Smith's hamsters, 60% of whose brain water had been ice. When asked this question, the cryobiologist could give no answer. He also wrote, "Biochemically, all functions measured to date have always survived freezing and thawing, even under poor circumstances, again in possible disagreement with the poor electron microscope (EM) results. Hence, the reality of the EM results and the possibility of artifacts in these results have been in question for some time." He goes on to say, "It is almost miraculous how well the tissue organization re-establishes itself in general after thawing, even in areas where gaps are present. However, the likelihood of extensive damage existing below the level of resolution of the light microscope, but all too visible in the electron microscope, appears high." Although a certain caution should be taken in accepting the results of a single preparation of a rabbit brain by a single experimenter, the cryobiologist's observations are not entirely inconsistent with those of Audrey Smith. As expected, the observed freezing was extracellular, rather than intracellular. But the damage seen not only seems inconsistent with the complete neurological recovery of Audrey Smith's hamsters, it also seems inconsistent with the finding that even without cryoprotectants, 80% of synapses in whole brain tissues cooled to −70ºC retain the metabolic properties of fresh brain biopsy synapses ["Metabolically Active Synaptosomes can be Prepared from Frozen Rat and Human Brain", JOURNAL OF NEUROCHEMISTRY 40:608-614 (1983)]. Could it be that the glycerol cryoprotectant contributes to extracellular damage in some way? In any case, concentrations of glycerol above 3.72 Molar (27.2%v/v) glycerol are not difficult to achieve in cryonics. Cryonicists are typically more concerned with eliminating structural damage than in loss of viability due to cryoprotectant toxicity. At high concentrations glycerol perfuses poorly into cells and osmotically draws water out of cells — resulting in dehydration. Often a cryonics patient has been perfused with glycerol at one location and shipped in dry ice (frozen carbon dioxide) for storage at another location. The solidification temperature (Tg) of glycerol is −90ºC, which is below the temperature of dry ice (−79ºC). But glycerol is viscous enough at dry ice temperature that little harm results from holding the glycerolized patient in dry ice for a few days. The result can be very damaging, however, if the dry ice is allowed to melt and the patient rewarms. The liquid portion of a glycerolized patient is about 20% water and about 80% glycerol. As can be seen from the diagram at the beginning of the section on ice blockers melting temperature (Tm) declines rapidly with increasing cryoprotectant concentration. In a glycerolized patient considerable melting of ice occurs at −60ºC and higher. Melting releases debris created by freezing and thereby causes loss of structural information that could potentially be used by future molecular repair technology. Moreover, cryoprotectant toxicity can result in structural damage to the debris and damaged tissues which is far worse on rewarming than what would occur when passing through the same temperatures on cooling. So extreme caution must be taken to prevent a glycerolized patient from rewarming from dry ice temperature. The cell membrane (plasmalemma) is the site of most freezing damage. Therefore good cryoprotectants may not only perform the anti-freeze function of preventing ice formation, but protect cell membranes as well. Cryoprotectant toxicity, however, can potentially affect any organelle or macromolecule — with proteins being the most vulnerable. Sugars are polyhydroxyl aldehydes or ketones (carbon chains with terminal aldehydes or ketones and hydroxyl side-chains). Glyceraldehyde is a very simple sugar. High levels of sugars and sugar alcohols (polyols) are found in many polar plants, insects, fungi, etc. as non-toxic cryoprotectants. The fact that fructose will not crystallize is the reason sucrose is used as table sugar, despite the fact that fructose is cheaper. Northern frogs use glucose as a cryoprotectant. When temperatures drop the livers of these frogs produce large amounts of glucose which a special form of insulin allows to enter cells in large quantity. The heart and brain does not freeze, but much of the rest of the body does (the frog is two-thirds ice). Upon thawing the frog must rapidly remove the glucose to prevent metabolic injury, but the glucose is saved in a special bladder because the frog cannot risk losing so many precious calories. Gradually, the glucose from the special bladder re-enters the plasma for metabolism or storage in the liver [JOURNAL OF MOLECULAR ENDOCRINOLOGY; Conlon,JM; 21(2):153-159 (1998)]. The two disaccharides (sugars composed of two simple simple sugars) that most protect proteins & cell membranes against chilling, freezing & dehydration are sucrose (fructose,glucose) and trehalose (glucose,glucose). Sucrose is the most common sugar found in freezing-tolerant plants — which can increase their sucrose levels ten-fold in response to low temperature. Sucrose and trehalose inhibit the membrane mixing associated with chilling. Both sugars fit well in cell membranes, binding to phospholipid head groups. Trehalose constitutes 20% of the dry weight of organisms able to survive complete dehydration. Trehalose has an abnormally large hydrated radius — well over twice as large as other sugars — and (unlike other sugars) is totally excluded from the hydration shell of proteins. Cryoprotection from freezing injury can differ from cryoprotection for vitrification — reducing electrolyte toxicity might be more important for the former, but it would not be so important for the latter. Sucrose and ethylene glycol have been used in combination to vitrify human oocytes [HUMAN REPRODUCTION; Kuleshova,L; 14(12):3077-3079 (1999)]. But sugars are more often used as cryoprotectants against freezing and chilling injury rather than for vitrification, with the disaccharide sucrose being more effective than the monosaccharide glucose [CRYOBIOLOGY; Santarius,KA; 20(1):90-99 (1983) and CRYOBIOLOGY; Carpenter,JF; 25(3):244-255 (1988)]. Carbonyl groups (>C=O) such as are found on aldehydes (RCOH) and ketones (RCOR') can reduce certain heavy metal ions (ie, "reduce" the positive charge by adding an electron). Copper ion in the plus two state (Cu2+), for example, can be reduced to the plus one state (Cu+) in the presence of a ketone or aldehyde. (Sugars are ketones or aldehydes, eg, glucose is an aldehyde and fructose is a ketone.) Copper and iron ions in the reduced state can result in production of damaging hydroxyl radicals as a result of the Fenton Reaction. Because most sugars have free aldehyde or ketone end-groups, they readily bind to the free amine group of lysine or arginine on proteins, a process called glycation. Sugars that participate in this reaction are called reducing sugars. All monosaccharides are reducing sugars because, although the carbonyl group may not be exposed when a ring structure is formed, the carbonyl group is exposed when a hemiacetal ring opens (e.g., in the interconversion of glucose between anomeric forms). Monosaccharides can dissolve in cryoprotectant solutions more readily and vitrify at lower concentrations than disaccharides [CRYOBIOLOGY; Kuleshova,LL; 38(2):119-130 (1999)], but because of their capacity for glycation, monosaccharide exposure to protein should be brief and at low temperature. A 220 millimolar D-galactose solution was shown to be nearly as effective a cryoprotectant as 5% DMSO for human embryonic liver cells (and substantially better than D-glucose) [GLYCOBIOLOGY; Chaytor,JL; 22(1):123-133 (2012)], but galactose can be five times more glycating than glucose. 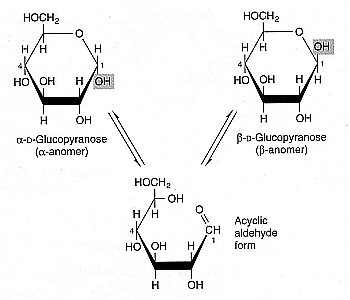 Some disaccharides (such as maltose) are reducing sugars because the link between the composite monosaccharides (the glycosidic bond) does not prevent the composite monosaccharide hemiacetal rings from opening. But trehalose and sucrose are non-reducing sugars because their glycosidic bonds do prevent opening of hemiacetal bonds. In acidic conditions, however, sucrose is far more vulnerable to hydrolysis into its reducing-sugar monosaccharides than is trehalose [CRYOBIOLOGY; Crowe,JH; 43(2):89-105 (2001)]. To the extent that glycation plays as role in enzyme stability and membrane stability associated with freezing damage or chilling injury, trehalose is a superior cryoprotectant to sucrose. Disaccharides like trehalose and sucrose do not cross cell membranes, however, and thus only protect the inner cell membranes of organisms that synthesize them. Trehalose allows yeast to dehydrate, and can reach up to 35% of the dried weight. Trehalose is a blood sugar for lobsters, but it is not synthesized by vertebrates. Many strategies have been attempted to get trehalose inside of vertebrate cells so that its cryoprotective, protein-protective and membrane-protective properties can be of benefit on the inside as well as on the outside of cells. Plasmids containing the trehalose transporter gene TRET1 from African chironomid larvae [PROCEEDINGS OF THE NATIONAL ACADEMY OF SCIENCES (USA); Kikawada,T; 104(28):11585-11590 (2007)] have been transfected into Chinese hamster ovary cells, resulting in a seven-fold increase in trehalose and a 400% increase in growth after dessication [CRYOBIOLOGY; Chakraborty,N; 64(2):91-96 (2012)]. Microinjection has been used to get trehalose into human oocytes — which improves cryopreservation [FERTILITY AND STERILITY 77(1):152-158 (2002)]. When combined with 0.5 Molar DMSO, 0.5 Molar trehalose microinjected into mouse oocytes resulted in excellent cryosurvival and healthy offspring (presumably because trehalose alone would not enter organelles such as mitochondria and endoplasmic reticulum) [BIOLOGY OF REPRODUCTION; Eroglu,A; 80(1):70-78 (2009)]. Transplanted tissue-engineered epidermis that had been cryopreserved with a trehalose/DMSO mixture was indistinguishable from fresh control grafts [BIOMATERIALS; Chen,F; 32(33):8426-8435 (2011)]. Trehalose may also protect macromolecules by being a free radical scavenger [JOURNAL OF BIOLOGICAL CHEMISTRY; Benaroudj,N; 276(26):24261-24267 (2001)]. Nonetheless, non-penetrating cryoprotectants can assist vitrification because most nucleators are extracellular and because dehydration allows for intracellular vitrification by bound water. Extracellular vitrification which involves sugar prevents cell membranes from coming in contact and fusing [ANNUAL REVIEW OF PHYSIOLOGY; Crowe,JH; 60:73-103 (1998)]. Cell membranes are commonly believed to be the part of cells most vulnerable to freezing damage. Trehalose displaces bound water and protects cell membranes by hydrogen-bonding to proteins and the polar ends of phospholipids more strongly than bound water [ARCHIVES OF BIOCHEMISTRY AND BIOPHYSICS 245(1):134-143 (1986)]. At the phospholipid bilayer of cell membranes trehalose is able to displace water molecules bound to carbonyls, but sucrose is not [BIOPHYSICAL JOURNAL; Amalfa,F; 78(5):2452-2458 (2000)]. Trehalose interacts more strongly with water than does sucrose, at least partly because sucrose forms intramolecular hydrogen bonds [THE JOURNAL OF PHYSICAL CHEMISTRY B; Lerbret,A; 109(21):11046-11057 (2005)]. 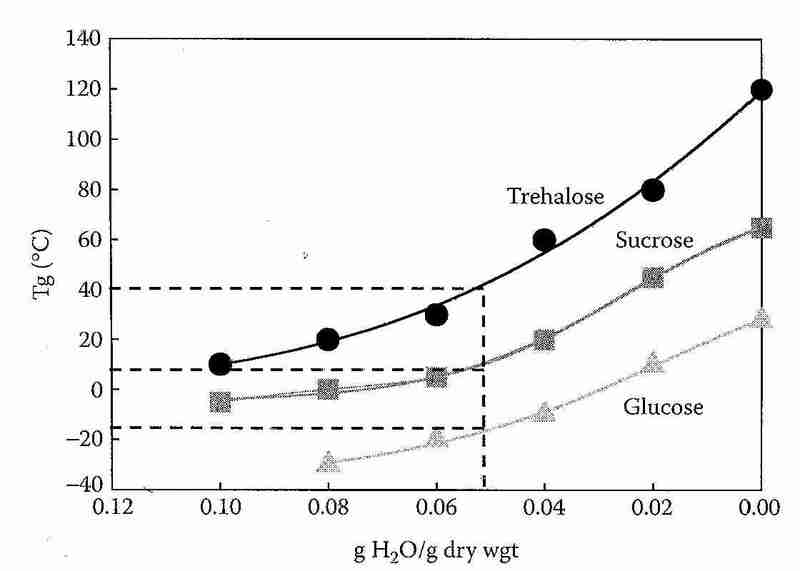 Trehalose has a hydration radius that is 2.5 times greater than that of sucrose, and 2.5 times the concentration of sucrose is required to provide an equivalent amount of protein protection [ARCHIVES OF BIOCHEMISTRY AND BIOPHYSICS; Sola-Penna,M; 360(1):10-14 (1998)]. 1.5 Molar solutions of trehalose & sucrose contain 62.5% & 87% water by volume, respectively. The greater hydrated volume of trehalose reduces freezable water and increases viscosity [PROTEIN SCIENCE; Jain,NK; 18(1):24-36 (2009)]. Trehalose has been shown to be about twice as effective as sucrose in suppressing ice crystal growth, evidently due to the larger hydration radius [JOURNAL OF CRYSTAL GROWTH; Sei,T; 240(1-2):218-229 (2002)]. At 41.7 wt% trehalose concentration crystal growth is about one quarter of what it is at 20.8 wt%. At 52.1 wt% trehalose crystal growth rate diminishes as crystal size increases. Trehalose has a higher glass transition temperature (Tg) than sucrose or any other disaccharide studied. As a group, disaccharides have a Tg that is on average about 60ºC higher than monosaccharides [FRONTIERS IN BIOSCIENCE; Furuki,T; 14:3523-3535 (2009)]. At 5% water content, Tg for trehalose is about 40ºC whereas Tg for sucrose is about 15ºC. After being stored at 44ºC for 45 days glucose/sucrose samples lost their amorphous state completely, whereas less than 4% of glucose/trehalose samples had crystallized [BIOCHEMCIA ET BIOPHYSICA ACTA; Sun,WQ; 1425(1):235-244 (1998)]. Disaccharides are examples of the class of cryoprotectants that do not cross cell membranes: non-penetrating cryoprotectants. Non-penetrating cryoprotectants are partly effective because ice forms much more readily outside of cells than inside cells due to the fact that nucleating agents are much more prevalent outside of cells than inside cells. In general, non-penetrating cryoprotectants are much less toxic than penetrating cryoprotectants. Many effective cryoprotectant cocktails combine non-penetrating cryoprotectants with penetrating cryoprotectants, thereby reducing the amount of penetrating cryoprotectant required. Non-penetrating cryoprotectants act partially by inducing cell dehydration, thereby reducing the amount of ice that can form in cells. For that reason, non-penetrating cryoprotectants are used in classical cryopreservation methods involving freezing. Although the penetrating cryoprotectant glycerol is widely used for erythrocyte cryopreservation, efforts have been made to use the non-penetrating cryoprotectant hydroxyethyl starch (HES) because HES is a harmless plasma expander that would not need to be removed from erythrocytes after warming and prior to transfusion — as is required with glycerol. Although one study concluded that the increased hemoglobin (increased hemolysis) associated with unwashed cryopreserved erythrocytes is not harmful [ANESTHESIA &AMP; ANALGESIA; Horn,E; 85(4):739-745 (1997)] concerns over possible renal toxicity from the increased hemoglobin have prevented clinical use of HES [TRANSFUSION MEDICINE REVIEWS; Scott,KL; 19(2):127-142 (2005)]. Erythrocytes preserved in liquid nitrogen with the nonpenetrating cryoprotectants trehalose and Dextran−40 retained normal shape and enzyme activity, but had a 56% reduction in ATP [CRYOBIOLOGY; Pellerin-Mendes,C; 35(2):173-186 (1997)]. Glycerol was the first CryoProtectant Agent (CPA) to gain widespread use in cryobiology, for cryopreserving red blood cells and sperm. The value of DMSO (DiMethylSulfOxide) as a CPA was discovered not long thereafter. Other polyols, such as ethylene glycol (automobile anti-freeze) and propylene glycol (formerly used to reduce ice formation in ice cream) were later shown to be effective cryoprotectants. Glycerol is still regarded as superior for cryopreserving spermatazoa from nearly all species, but lactamide results in motility for rabbit spermatazoa that is nearly double that seen for glycerol [JOURNAL OF REPRODUCTION AND DEVELOPMENT; Kashiwazaki,N; 52(4):511-516 (2006)]. Cryoprotectants are assessed by means of a number of parameters, including glass transition temperature (Tg), permeance, viscosity, toxicity, and concentration needed to vitrify (Cv). Cv is the minimum required concentration of the particular CPA which will vitrify, which is an important quantity to keep in mind because concentrations too much above this minimum result in increased toxicity without increased benefit. Amides are weak cryoprotectants compared to polyols (formamide is too weak to vitrify on its own, but can assist vitrification by other cryoprotectants). Both amides and polyols become stronger cryoprotectants (have lower Cv) by the addition of methyl groups, as can be seen from the structures and Cvs of methylated amides and polyols [from CRYOBIOLOGY; Fahy,GM; 24(3):196-213 (1987)]. A Nuclear Magnetic Resonance (NMR) study has indicated that methylation increases hydrogen bonding strength of the polar groups [JOURNAL OF PHYSICAL CHEMISTRY; Forsyth,M; 94:6889-6893 (1990)]. Compared to propylene glycol (1,2-propanediol), 1,3-propanediol has a higher concentration needed to vitrify (57% versus 44%) and a higher homogenous nucleation temperature for a 20%w/w solution (−60ºC versus −68ºC), indicating that it is weaker and even less toxic than ethylene glycol in comparison with propylene glycol [CRYOBIOLOGY; MacFarlane,DR; 27:345-358 (1990)]. Much less inhibition of disaccharidases is seen with 1,3-propanediol compared to propylene glycol [BIOCHEMICAL MEDICINE AND METABOLIC BIOLOGY; 45(2):161-170 (1991)]. Although polyols have long been known to be good cryoprotectants, other CPAs [such as methoxlylated compounds — ie, CPAs in which a methyl (-CH3) group is added to an alcohol to make an ether] now being considered are less toxic and more penetrating. Aside from osmotic effects, however, glycerol is probably the CPA which damages cell membranes the least, compared to DiMethyl SulfOxide (DMSO), ethylene glycol, propylene glycol or methoxylated compounds — because these other compounds are more likely to have a dissolving effect. Glycerol is, however, biochemically toxic because kidney tissue cannot be subjected to more than 3-4 molar glycerol without loss of viability. Methoxylated compound toxicity may be similar to ethylene glycol. Human sperm membrane, for example, is 4 times more permeable to ethylene glycol than to glycerol. And the membrane transport of ethylene glycol is less affected by temperature than is glycerol [HUMAN REPRODUCTION; Gilmore,JA; 12(1):112-118 (1997)]. Ethylene glycol is toxic at 38ºC due to metabolism to oxalic acid by alcohol dehydrogenase in the liver. The oxalic acid can precipitate as calcium oxalate crystals in the brain, heart, kidney, lung and pancreas causing hypocalcemia — with the greatest damage being seen in the kidney (see PRINCIPLES OF INTERNAL MEDICINE by Harrison). Methoxylated compounds can have similar toxicity to that of an unesterified glycol (glycol = alcohol with two hydroxyl groups) like ethylene glycol because they are easily hydrolyzed. But glycol ethers can have other toxic effects, such as hemolysis and chromosome damage (see Casarett & Doull's TOXICOLOGY). It is doubtful, however, that many of these toxic effects would be seen during the application of a cryonics protocol — with the blood being washed-out thereby preventing liver metabolites from reaching other cells. Moreover, ethylene glycol is of variable toxicity — found to be nontoxic for cow embryos, for example [HUMAN REPRODUCTION; Gilmore,JA; 12(1):112-118 (1997)]]. Insofar as the cell membrane (plasmalemma) seems to be the cellular structure that is the most critical target in chilling and freezing injury, stabilization of cell membranes can be a significant aspect of cryoprotectant action. Proline, betaine, sarcosine, glycerol, DMSO, trehalose and sucrose all reduce membrane fusion. Proline, betaine and sarcosine stabilize phosphlipid bilayers by hydrophobic interactions. Hydrophobic interaction with membranes is a less effective means of membrane stabilization than the hydrogen bonding of the other cryoprotectants [CRYOBIOLOGY; Anchordoguy,TJ; 24(4):324-331 (1987)]. Studies by 21st Century Medicine (21CM) researchers on kidney slices have indicated that the relative order of toxicity matches the order of glass-forming ability. Formamide is exceptional, being the most toxic CPA while having the weakest glass-forming capability. Mixing CPAs reduces the toxicities of many of the individual agents. A cryoprotectant mixture with high glass-forming ability, low toxicity and low viscosity is the elusive goal of vitrification research. At the 2005 Society for Cryobiology Conference, 21st Century Medicine announced that it had successfully vitrified a rabbit kidney to solid state, rewarmed the kidney and transplanted it to a rabbit with complete viability [ORGANOGENESIS; Fahy,GM; 5(3):167-175 (2009)]. A rabbit brain has been vitrified with the same cryoprotectant mixture with no ice formation [ANNALS OF THE NEW YORK ACADEMY OF SCIENCES; 1019:559 (2004)]. In both cases the cryoprotectant mixture used was M22 [CRYOBIOLOGY 48:157-178 (2004)], a 65% w/v (9.35 M) cryoprotectant mixture having a melting temperature of −55ºC and a Tg of −123.3ºC. (M22 was so-named because of the intention to introduce this vitrification cocktail to a biological specimen at Minus 22ºC.) The vitrified kidney was held at −135ºC for 4 minutes. Cryoprotectants are not simply added to water, they are added to an isotonic carrier solution that often can act as an organ preservation solution. The carrier solution used for M22 is LM5, a mixture of glucose, mannitol, lactose, KCl, K2HPO2, GSH, NaHCO3, and adenine HCl [TABLE 1; CRYOBIOLOGY; Fahy,GM; 48(2):157-178 (2004)]. Adding ice blockers and reducing the amount of glucose in a previous carrier solution cut the required warming rate to prevent devitrification by more that half. Choice of carrier solution can affect tissue recovery, and the composition of tissue fluid also has an effect [CRYOBIOLOGY; Wusterman,MC; 56(1):62-71 (2008)]. M22 was optimized for kidney slices. The cryoprotectant solution used by the Cryonics Institute (CI−VM−1) has 35% ethylene glycol and 35% dimethyl sulfoxide, a pair of cryoprotectants that can reduce toxicity when used in combination [REPRODUCTION, FERTILITY, AND DEVELOPMENT; Gautam,SK; 20(4):490-496 (2008)]. The carrier solution is m−RPS−2, a mixture of glucose, KCl, HCl, and TRIS buffer. CI−VM−1 is a more powerful and much less expensive cryoprotectant mixture than M22, but it is more toxic. CI−VM−1 was optimized on hippocampal slices by cryobiologist Dr. Yuri Pichugin. The Devitrification Problem arises from the fact that the temperature range of maximum nucleation (maximum nucleus formation) is much lower than the temperature range of maximum ice crystal growth rate. Maximum nucleation temperature for M22 is in the −110ºC to −120ºC range (becoming undetectable at both ends by −90ºC and −140ºC), whereas maximum crystal growth rate temperature is in the −50ºC to −60ºC range (becoming undetectable at the lower end by −95ºC) [CRYOBIOLOGY; Wowk,B; 55:330 (2007) [ABSTRACT]]. When cooling with cryoprotectant, the maximum growth rate range is not of concern because there are no nuclei to grow. The main concern on cooling is the maximum nucleation range, which increases near Tg. The ideal is to cool quickly enough to reach Tg without any nuclei forming. But if nuclei are formed the rapid cooling & high viscosity near Tg will not allow the nuclei to grow very much and thus prevents them from being very harmful. One solution to the Devitrification Problem is to rewarm at extremely high rates. Microwave oven frequencies (2450 MegaHertz) cannot be used for this purpose because microwaves produce uneven warming leading to head-denaturation of some parts of tissue, while other parts are still too cold and vulnerable to ice growth. But electromagnetic waves in the range of 300-1,000 MegaHertz can heat more uniformly than microwave frequencies. The dielectric properties of the cryoprotectants affects the uniformity of electromagnetic heating. At appropriate frequencies a changing electric field can rotate polar molecules in a glassy solid resulting in lattice waves affecting the thermal conductivity. At low temperature a Debye model most accurately represents predicted heat capacity as a function of temperature. Thermal runaway can occur if some regions warm more rapidly than others, and the warming lowers thermal conductivity and thermal diffusivity. Propylene glycol can be heated in a 434 MegaHertz dielectric field with greater uniformity than 2,3−butanediol [PHYSICS IN MEDICINE AND BIOLOGY; Robinson,MP; 47(13):2311-2325 (2002)]. In his breakthrough vitrification of 50,000 cell Drosophila embryos (embryos already differentiated into tissues & organs, including muscle & nerve) with ethylene glycol, Peter Mazur found that warming rates of 100,000ºC per minute were essential for preventing devitrification. Dropping warming rates to 2,000ºC per minute reduced survival from 12% to 0% [SCIENCE; Mazur,P; 258:1932-1935 (1992)]. A second way of preventing devitrification is the use of anti-nucleators, such as polyvinyl alcohol. A third way would be to use cryoprotectant mixtures which are so concentrated that no ice can ever form. The 2004 cryoprotectant/ice blocker formulation from 21st Century Medicine can avoid devitrification in 10mL volume with warming rates as low as 0.4ºC per minute [CRYOBIOLOGY 48:157-178 (2004)]. The Devitrification Problem arises because of the desire to maximize viability. All cryoprotectant agents are toxic, some more than others. Vitrification can be achieved by using a small amount of cryoprotectant and by cooling fast enough to avoid nucleation. If cryoprotectant toxicity was not a concern, however, and the most toxic cryoprotectants were used in high concentration, there would be no devitrification at any cooling rate. Near Tg, slower cooling rates are advisable to prevent surface fracturing — which can be done without much risk of crystallization due to the high viscosity at low temperature. A description of the physical problems in vitrifying large biological systems can be found in CRYOBIOLOGY 27(5):492-510 (1990). Propylene glycol — which has a Tg 10-20ºC above that of glycerol — is the cryoprotectant described in this paper. The lower the temperature below Tg at which fracturing occurs, the more extensive is the fracturing and the more finely-divided are the fractures. Rapid cooling causes more contraction on the outer portions than the inner portions of a large vitrified biological object — although literally there is a continuum of temperature and contraction from the outer surface to the center. Metals can be cooled at a rate that is slow enough that thermal stresses will not build-up and the metal can be cooled to any temperature without cracking. But metals are held together by covalent bonds, which are much stronger than the hydrogen bonds that bind vitrified biological materials. Also, metals are much better conductors of heat than are vitrified biological materials, which means that thermal equalization of temperature can happen much more quickly in metals. Nonetheless, the thermal strain of samples permeated with cryoprotectant has been measured to be only about three-quarters the strain of a pure cryoprotectant sample at temperatures above Tg [ANNALS OF BIOMEDICAL ENGINEERING; Rabin,Y; 33(9):1213-1228 (2005)]. In theory it should be possible to cool cryonics patients to liquid nitrogen tempeature slowly enough that no thermal stress accumulates and no cracking occurs. In practice this could take weeks or months. Objects the size of a human head cannot easily be taken more than 20ºC below Tg without major cracking. So for practical reasons cooling is done over a matter of days to minimize cracking. "Intermediate Temperature Storage (ITS)" is based on the idea that by storing just below Tg (−130ºC) cracking is considerably lessened. Rabbit carotid artery segments have been successfully vitrified and rewarmed with viability by optimizing cooling and warming rates, storage near −131ºC or −132ºC, and examining the vitrified tissue for fractures using a cryomacroscope [CELL PRESERVATION TECHNOLOGY; Baicu,S; 4(4):236-244 (2006)]. Unfortunately, storage at −130ºC costs about twice as much as storage at −196ºC (liquid nitrogen temperature) because of the greater space requirements and increased liquid nitrogen required to cool that space. Even ITS cannot eliminate cracking altogether, because incomplete perfusion of cryonics patients results in localized ice formation and localized areas of elevated Tg (Tg').